**As I type this post on a Tuesday evening, I'm just going to hope that most of you either haven't noticed how late this post is, or have just gotten so used to my lack of timeliness that you really don't care by this point. So far the “make the readers do all the work” scam… errr I mean “Tell Your Story” segment has been a resounding success. We’ve had great contributions from Uncle Jim, Ronbo and Robert. My inbox has also been flooded with stories from readers around the world (though most of them have little to do with football and seem to all end with requests for my banking information). Man in the Bush has been submitting stories but most of them have little to do with football and all seem to end with requests for people’s phone numbers, addresses measurements, hopes and fears and openness to acts so lewd it would make an adult film star blush. So I’ve gone ahead and spared you the emotional scarring and refused to post them. I promised a prize when this all began and I am a man of my word. A donation to the Human Fund will be made on behalf of everyone who submitted a story. Congratulations! Now onto the news of the day which of course is that the Riders have released Chunky Adams after 8 seasons. This is another one of those mixed feelings things for me. On one hand to call Chunky one of the best DTs in the league would be about as accurate as calling me one of the most timely and grammatically accurate bloggers. On the other hand, I doubt few gave as much effort as Adams. Plus its not like he was bad... he was good enough to hold down the starters spot for a number of years. Fact remains that nobody was able to beat him out. I'm kinda surprised they cut him rather than bring him to camp and see if someone can finally beat him out. But I guess they knew in advance he wasn't in Coach Marshall's plan for a bigger more physical defensive front (they must be confident they have someone to replace him with), and so it was better to cut him early and give him a chance to catch on elsewhere (not sure where that would be but its a chance at least). So we bid adieu to one of the most oddly shaped players I can remember. Boyd signed a 3 year contract… but unless the Argos figure out how to pass the ball, the wear and tear his poor body his going to take will likely mean that he’ll fulfill a maximum of half of that. Romero had 2 major knocks against him in that he was the wrong side of 30 and a well paid American. One of those is generally enough to earn to you a pink slip in the Tillman regime. Both makes is a virtual certainty. I just read an article that talked about how the start date for the new team in Ottawa might be pushed back a year due to a legal challenge to the renovations at Lansdowne Park. The irony here is that the current incarnation of a CFL team in Ottawa might exist longer as a conditional franchise than the previous one did as an actual franchise. But that got me thinking (as usual it was about something else that is only loosely related to where I started), regardless of when they start playing, they will eventually have to decide on a team name. Now for obviously reasons we here in Saskatchewan are opposed to them resurrecting the Rough Riders. But rather than gripe and complain, I decided to take a more proactive approach and try and help the owners in Ottawa and the CFL big wigs come up with a list of potential names for the new franchise that would be acceptable to us here on the prairies. 9 – Ottawa El Ninos – a disruptive occurrence that comes around every few years. 8 – Ottawa Leap Years – Continuing along the “only comes around very 4 years” theme. 5 – Ottawa Argo Nots or Stamp Eaters – Seriously, go mooch off another franchise and leave us alone! 4 – Ottawa Gutless Poker Players – They are likely just going to fold. 3 – Ottawa Minority Governments – They have roughly the same stability and longevity. 2 – Ottawa Mulligans – Those last 2 were just a practice. This time it counts… unless it’s another practice. 1 – Ottawa Herpes – They reappear sporadically after periods of remission… and it’s rarely a pleasurable visit. Monday Morning Sentimonies: Something Happened! Well thankfully late Friday something actually happened with the Riders. That is good news for you the readers as my back-up plan for today's post was to analyze in detail where my March Madness bracket went wrong (hint: it had something to do with knowing absolutely nothing about college basketball). Friday Brendan Taman and Eric Tillman finalized a deal that us ship DB prospect Ladarius Key to Edmonton in exchnage for KR Tristan Jackson. At first glance I think this is a great trade. Basically we gave up a practice roster DB for a 25 year old kick returner who is a dangerous kick returner. Now you have to factor in that Jackson is probably making decent money (which likely made him expendable by Tillman standards) and that he has been plagued by injuries throughout his career (especially last year). But I still think Key is a small price to pay for someone with Jackson's potential. All I can is that Jackson better pan out for Taman's sake. otherwise he'll have gone 0 for 3 in the acquiring kick returners who used to be good department. Dorsey failed, Grease-Mullen failed. it's all on Jackson. Fortunately he has one major force working in his favour that the other 2 did not... mainly not have a complete idiot as his special teams coach. That said if we can't muster a return game out of Craig Dickenson and Tristan Jackson, we might as well just quit trying because it obviously ain't in the cards. Wow it will be an epic Cobb vs. Ahmad Green show down at RB in camp... watch for both to lose and end up cut. How many times does Champion need to be cut before he should be forced to change his last name? So far this has been a typical March football-wise… which means not much is happening. And the stuff that is happening is barely worth mention (unless you really care about Winnipeg cutting Frank Wilczynski). Normally when news is thin I turn to one of my patented filler posts. Unfortunately I used them all up in my Salute to US Expansion. So my backup backup plan is to make you do my work for me. Its an idea so ingenious I can’t believe it took me this long to think of it (and even then I didn’t so much thin about it as steal the idea from Ronbo and pass in off as my own). So, to help me pass the time, I invite you to share some of your best football related stories. They could be about an experience at another stadium, off-field encounters with CFL players. Hell, it could be about something non-football related as long as it’s funny. Submit your stories either by leaving a comment or emailing me. The best story will win a prize. I have no idea what the prize will be but I’ll figure something out. I’ll give you a few of my own stories to get the ball rolling. - I once played against Jason Clermont in a touch football game. On one particular play I thought I had Clermont covered in the endzone. Needless to say I quickly found out why he is a professional football player and I am an unpaid football blogger. Since I’m out of obscure former football franchises to talk about (unless I start making them up… which I’m not above), I guess I had better get back to talking about actual news. News is predictably thin this time of year so you stuck with a dose of Random Quasi-Coherent Thoughts. - We start on a sombre note, with Kitwana Jones signing with the Alouettes. Kitwana has always been one of my favourite players so it’s certainly sad to see him go. That said I understand why the Riders didn’t re-sign him. Realistically Kitwana would have been at best a special teams player who filled in on D in an emergency. Not to devalue Special Teams play (especially after last year’s debacle) but its tough to justify holding a roster spot for an aging guy who will never be a full time starter when you could just a s easily give it to a young up and comer whose has potential to develop into a starter. Again, I don’t like it but I see the logic. - If history has taught me anything though. Kitwana will go to the new time, the only noteworthy thing about his time there will be chasing down a criminal and he’ll find his way back to the Riders by mid-season. - Big but not overly surprising news came when Edmonton cut Mo Lloyd (by the way, I’ve never got why the two L’s are needed for this name, always seemed like a bit of overkill). Lloyd must hate Eric Tillman. First Tillman won’t open the vault for Lloyd in 2009 so, he ends up signing with a far crappier team. Then Tillman shows up and cuts him on a count of the inflated contract Lloyd has with said crappy team. At every turn Tillman seems to be on Mo like a babysitter… too soon? - Speaking of Tillman , he is certainly scrapping the bottom of the barrel in his desperate attempt to introduce some Canadian content to the barren Esks. He has now acquired the highly acclaimed Delroy Clarke (I know who?) from Toronto for a 4th round pick in 2012. I’m honestly waiting for my call from Tillman to come play for him since as a Canadian who has played football, I’m almost overqualified compared to what the Esks had when ET walked in the door. Today we wrap up our salute to US Expansion with a look at the worst CFL team that never was. The idea for a team in Miami came up prior to the 1995 season. Plans were made to purchase the Las Vegas Posse… or at least their tattered remains… and launch the Miami Manatees in time for 1996 season. They even staged an exhibition game at the Orange Bowl between Birmingham and Baltimore to introduce the Canadian game to Florida. The game was very poorly attended. While there were likely many factors that led to this, one major factor may have been the fact that Miami football fans found it hard to take a match up between two teams called the Cudas and the CFLers, seriously. - Thankfully the CFL dodged a bullet and never had to associate itself with a team called the Manatees. - As if that logo isn’t awesome. - The name Manatees. Also known as the sea cow. While it may be an intimidating moniker when you are talking about an overweight woman, it definitely isn’t when talking about a football team… unless it was a football team of overweight women. - A portion of ticket sales for the team was to be donated to save the manatees. While I’m all for teams and players supporting charities and the community, I’ll be damned if I’ll respect a team that supports dirty hippies and their stupid causes. It also makes no sense since I doubt the hippies that care about saving the manatees more than they care about personal hygiene even watch football. From a marketing perspective you would have had more success donating proceeds to causes like “punch the manatees” or “nuke the whales”. Now that’s something I would support! League suspended US operations in 1995 so the plans never came to fruition. The Manatees were banished the footnotes of CFL history. The year was 1995, the CFL was looking for additional American franchises to add to its US expansion efforts. Along came a Georgia business man by the name of Art Williams wanting to put a franchise in Birmingham. And who did he name as the GM of his new franchise? … None other than Roy Shivers. Notable Players: QB Matt Dunnigan, DB Eddie Davis, DL Anthony Drawhorn, WR Jason Phillips, OL Fred Childress. Roy Shivers. - Winning record and a playoff appearance. - Attendance started out very good… well at least until college football season started at which point it plummeted. - The nickname Cudas. Owner wanted a team name that would “scare the spit out of people”… I somehow doubt much saliva was lost due the name Cudas. - Like the Memphis Mad Dogs they decided to buck the trend when it came to jerseys and put a logo on the front. Now that design is bad enough before you factor in the lovely colour scheme the Cudas had going for them. - The owner openly criticized the Canadian rules and favoured chancing things to be more like the NFL… this included changing the name of the league. If only there were some option for people who want 4 down football on a small field with 11 players and not called the CFL. Tried moving the team to Shreveport following the 1995 season but the CFL ended up ceasing US operations completely so the team folded. We once again interrupt your regularly scheduled filler post for some actual news. That’s twice in a week which must be some kind of record. - The Riders signed 3 players this week (though to be fair 2 of the signings were widely known a long time ago). Joining the team are RB Brandon West, OL Bart Archdekin and WR Terrence Nunn. I find it hard to get excited about signings like this. I mean sure guys like Cary Koch and Chris McKenzie started out as “nobody signings” over the offseason and they turned out pretty good. But for every Koch and McKenzie there is a string of Bassis, Olajubutus, Fairooz’s and Nyenhuis’. - CFL Evaluation Camp went this past weekend. So far it remains up in the air who the Riders will be targeting with their #7 overall pick. Logic says we need to start getting some young OL prospects but there is also a case to be made for a kicker, a linebacker or even a receiver. - Adrian McPherson has signed a 2 year extension with the Alouettes. I wonder how many more times he is going to fall for Jim Popp’s assurances that Calvillo will retire soon. I also wonder how long before he takes matters into his own hand and runs down Calvillo in the parking lot. Last but not least, I wonder what the odds are that McPherson ends up retiring before Calvillo. - It seems the biggest issue in NFL negotiations was how to split $9 billion in revenue. By comparison the biggest issue in CFL negotiations was how to split a dozen donuts between the 20 people at the table since that's all they could afford. Thank god we didn't sign him! What do you think the odds are that Tillman offered the chance to retire with some dignity as opposed to be being unceremoniously cut? San Antonio was originally supposed to join the league along with Sacramento in 1993 but the owner ran out of money before the team could even get close to the field. This was the result of the owner (though I use the term loosely since he really didn’t “own” anything) at the time was an idiot and had nothing to do with San Antonio which was still seen as a good market for football. So following the 1994 season when the Sacramento Gold Miners were looking for a new home, the league decided to give a competent owner as shot a San Antonio-based franchise. - Only US expansion team to have a field big enough to actually have the right dimensions for the Canadian game. - Not much really. Unlike the other teams they had decent ownership and talent on their roster though attendance was decent at best. Following the 1995 season the CFL was prepared to purge itself of the crappy US franchises, namely everyone but Baltimore and San Antonio. The plan to keep the Texans and Stallions hit a major snag when Baltimore got chased out of town by the NFL. That would have left San Antonio as the only US team in the league. Rather then go at it alone, it was decided that the Texans would fold, ending the US experiment once and for all. What do you do when the NFL turns you down? You talk to the CFL. That’s exactly what Fred Smith did when the NFL didn’t go for his proposed Memphis Hound Dogs. - Had a good defense. Though that may be in large part due to the fact that their home field was not CFL regulation size (it was even smaller than the other US fields that were not regulation size) so it was easier to defend. - As mentioned above their field was tiny by CFL standards and this was despite the fact that they widened the field with Astroturf… which was odd given that the rest of the field was grass. Fate: Folded following the 1995 season along with the rest of the remaining US teams. We interrupt this string of filler posts on obscure CFL franchises from over a decade ago to bring you some actual news. The big news was the announcement the other day that Omarr Morgan had been released. The news was very bittersweet. On one hand there is a sense of sadness at having to part ways with a man who will go down in history as one of the best CBs this franchise has ever seen. One the other hand there is a sense of happiness at part ways with one of the clear weak spots of our team last year. Me and Omarr have what you would call a love hate relationship. 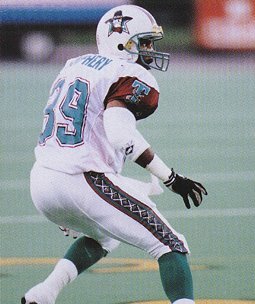 From when he joined the team in 2000, up until 2006 he was one of the premiere defensive backs in the CFL. A perennial all-star and a hero in Riderville for such feats as the game winning blocked FG against the Eskimos in 2005 (which still ranks among my favourite moments at Mosaic). Then in 2007 he made a decision with his wallet rather than his heart. No one begrudges him for doing that. I'm sure most people would have left for the money that they offered him. Unfortunately the end result was that he missed out on a Grey Cup ring in '07 with the team he loved. I'm sure Omarr would hand back all that money and more in a heart beat for that elusive ring. In 2008 (after being cut from Edmonton) Morgan returned home to the Riders. But he wasn't the same. During his time in Edmonton he developed a bad habit of giving a 10 yard cushion on every single play. Thus I began developing a vicious hatred for the one time great. In 2009, Morgan suddenly and unexpectedly enjoyed a resurgence. I actually had to briefly set aside my hatred (no small feat for someone as opinionated as me). Unfortunately that resurgence was short lived and Morgan was back to being terrible in 2010. After watching the first 6 years of Morgan's career, its seems almost unbelievable that he would end his tenure with the Riders as one half of the worst CB duo in the league. Thinking about my hatred for Omarr got me thinking about another hatred I had in the secondary... my biggest hatred: James Johnson. I got to thinking that the Johnson hatred can actually be blamed on Morgan. Were it not for his decision to sign with the Esks, nobody would even know who James Johnson is. Damn you Morgan! Seriously though, while it was clear that the time had come for Morgan to go, I still have to tip my hat to him because he is without a doubt one of the great players in this franchise's illustrious history. Watch it will be just Morgan's luck that we win the cup again in 2011. We also cut Willie Byrd... I neither had love or hate for him... just indifference. The news keeps getting better for our secondary as we announced that James Patrick, who just so happens to best safety in the CFL, has signed a contract extension. Add to that new deals for Frazier and McKenzie and we should have a solid secondary for years to come.